Prestigious piano teachers partnered in London with the aim of delivering outstanding piano lessons to piano students of all levels and ages. We have more than 10 years of experience in channelling musical creativity. WKMT is a full rounded musical group that works around the three dimensions of music: Education, Performance, and Production. Our Buenos Aires born director and founder is an elegant and active London composer and concert pianist. His approach to music is completely revolutionary. Professional Equestrian Rider and Classical Architecture Enthusiast, Juan Rezzuto manages and helps artists from all around the world. His experience and fine education define him as the ideal mentor for anyone looking to get fully immersed into the dynamic and inspiring world of music. 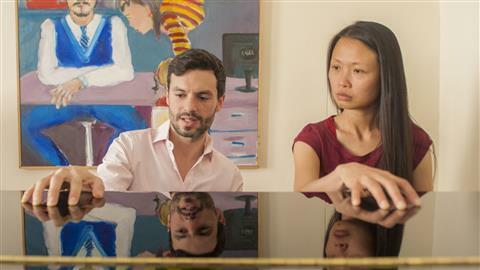 Our first-lesson-piano-students come to take lessons with a variety of expectations. Some of them want to become professionals, some of them want to play to avoid the stress of their everyday life, some of them bring their children so they can develop a special skill, some of them don’t know why they are coming... For those who come allured by the intellectual benefits associated with learning to play an instrument, providing them with a complete musical training is the only way to deliver what they are expecting. In order to musically develop our intellectual abilities, we have to be able to assess music, to perform it and to manage its delivery time-and-precision-wise. Achieving these goals imply changes in the way we process information. We need to order tasks smartly, prioritize muscular responses, assign each one of our senses to specific tasks. Ultimately, we have to organize a very complex message so it can be processed, emitted -using an external tool: the piano-, received, sensed and understood properly. If we are successful in completing this musical challenge, we will then have accessed the intellectual benefits of learning music. The good news: The three possible results are reached applying the same methodology. The process of relating to music is a fabulous one. It starts with us attempting to learn how to play an instrument; but that is just the beginning... We also need to learn how a professional would sound when playing that instrument. For that reason, attending concerts become paramount for our integral music development. Nevertheless, attending concerts on our own or just with people who don’t understand music will not necessarily help us developing our music perspective. Music is a social art and a language. As such, it needs to be practised. We not only practise the language when we perform, but we also practise this language indirectly when we express our opinions about a concert. In order to express our ideas about a concert we need to make use of all our knowledge about the piece in question, the challenges involved in performing live and the instrument used during the performance. Conversing about these topics with a fellow student, immediately after a concert, can prove to be very positive for the healthy development of our musical perspective. If we attend concerts together with our fellow music students, we increase the probabilities of having an interesting musical conversation. The latter can motivate us to use our musical knowledge to produce valuable ideas about the concert we have just listened. In this way we will be practising our critical skills and, hopefully, perfecting our self-criticism. Working on our music skills during the lessons and attending concerts are two dimensions of a three-part learning cycle. The last dimension of our musical learning is represented by the “perfectioning of our ability to perform”. What kind of language learning we would be attempting to do if we never exercised “speaking”? When we perform in front of an audience that is exactly what we do: we speak in musical terms. The level of focusing we need to apply to our performance is unique of the stage situation. It is the most exciting challenge a musician can face and by far the most edifying. It is like jumping out of the plane for skydivers. At WKMT we make sure all our students get these three main musical aspects properly stimulated. Music Studios in London - Music Studios in London at WKMT are designed to provide the perfect environment for musicians. Our premises benefit from a prime location within West - central London. We are just round the corner of West Kensington Station. We are accessible via District and Piccadilly Lines. Despite being easily accessible, our studio is secluded enough to provide our students with a superbly silent environment. All these conditions make WKMT the ideal music studio in London for recordings and musical training. In 2016, we also conquered South London with our new piano studio in Camberwell. Also well-conected for your piano lessons. We believe our students should be surrounded and enveloped by music as they cross our front door. Our rooms are carefully decorated to reflect our welcoming attitude. Classical music is not only a discipline but also a philosophy. At WKMT we are proud to be one of the most indulgent music studios in London. Enrolling at WKMT is very easy. Just send us an email or call us on +442071014479 Monday to Sunday 9 am to 9 pm. Wonderful place to learn piano. Teachers are talented, patient and friendly. Both my wife and my daughter are having their piano lessons here. They are enjoying!